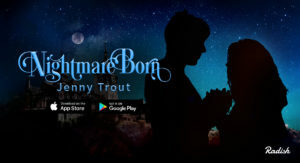 My Young Adult serial novel, Nightmare Born, will debut on the Radish app in October! Yes, this October! The one that is on the way! So, what is Nightmare Born about? It’s about Iris Bianchi, an autistic teenager who learns that her father is the King Of Nightmares and that she is a Nightmare Born, a supernatural creature that can only be conceived in human dreams. Called to Miss Perkins’s School For Girls for her magical training, Iris is soon immersed in the supernatural underworld of Savannah, Georgia. Imagine American Horror Story: Coven, The Vampire Diaries, Harry Potter, and The Magicians all got thrown into a blender together to make a delicious and satisfying paranormal YA smoothie, but then I started just pouring various different types of candy into it. I’m so excited to share every little bit of this journey with you guys. More info will be coming soon!